Full day valley sightseeing with Kathmandu Durbar Square, the place of the Malla and then the Shah Kings of Nepal, visiting Kumari Temple, house of the virgin goddess, visiting Swyambhunath, a stupa on the top of hill - from here you can overlook the scenery of Kathmandu, Visiting Patan city, the second largest town in the valley, Krishna Mandir, Golden Temple etc. After a trek of about one hour from Syabrubensi the small village of Wangal is reached. From here a trail branches off straight eastwards to Rasuwa Ghari. From Wangal there is a steep climb to Khanjung village. In the village there is a good camping site. From there, after 1/2 hr climb a small village is reached, known as Surka. The climb is steep for an hour through thick forest and from there the trail continues straight. Day 05: Lama Hotel - Langtang Valley (3310m) 05:00hrs. From Lama hotel, the trail then traverses up and down through the forest and Ghoratabela (9800ft.) is reached within 5 hrs. 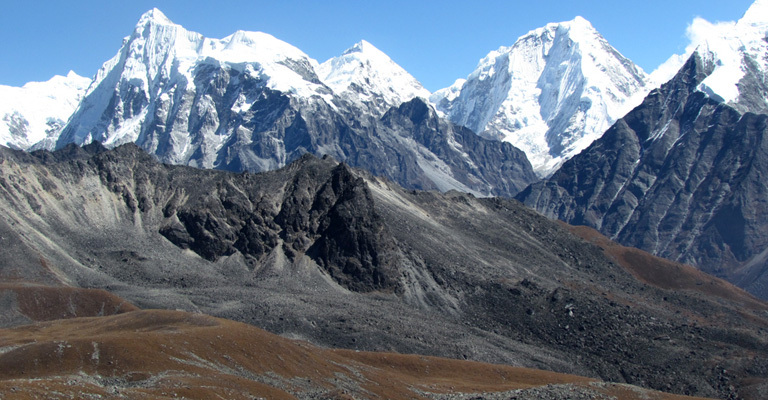 From there, again a short climb for 1/2 hrs will bring you to a pass to the right of where the Langtang valley begins. Day 06: Langtang Valley - Kyanging Gomba (3700m) 03:00hrs. From the pass, after trekking for nearly 3 hrs, Langtang village (11200 ft.) is reached. From Langtang there is a gentle ascent for 4 hrs to Kyangjing Gompa. Day 08: Kyanging gomba - lama Hotel (2470m) 07:00hrs. After visiting Kyangjing Monastery, an excellent look-out can be reached by climbing the slopes immediately behind the Kyangjing Gompa. A visit to Yala Cheese factory (15,800 ft.) and the small lake at 16,000 ft. beyond Yala is worthwhile. Then back to Langtang via same route. After breakfast, trek back through same way to Syabrubeshi.